Semiconductor foundry business continue to thrive in Taiwan. The world's number one semiconductor foundry Taiwan Semiconductor Manufacturing Co (TSMC) retains its number one position in the latest worlds semiconductor foundry ranking by Gartner. 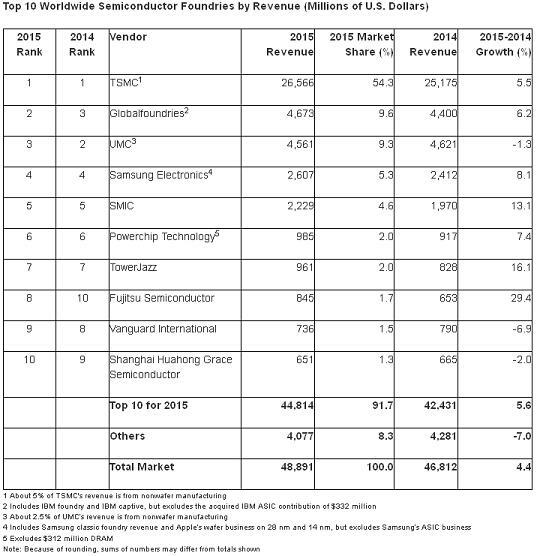 TSMC retained the top position amid weak semiconductor device market. The other Taiwanese semiconductor foundries include UMC, Powerchip Technology, Vanguard, which are ranked third, sixth and ninth in the global semiconductor foundry ranking. This makes Taiwan a country with largest market share in the semiconductor foundry business. Globalfoundries, the second ranked semiconductor chip contract manufacturer had increased its marketshare a little, so that it could move to second position from third position. Fourth biggest foundry in the world is Samsung Electronics whose share is also increased by less than 1%. Japan-based Fujitsu semiconductor, though ranked eighth grown fast by nearly 30% in the year 2015 compared to 2014. The second fast-growing foundry in the list is Israel's TowerJazz, ranked seventh by Gartner with the growth rate of 16% in year 2015 compared to 2014. China-based SMIC also a comparatively fast-growing semiconductor foundry has grown by 13% . Gartner ranked SMIC as fifth biggest semiconductor foundry in the world in 2015. The top 10 foundries constitute nearly 90% of the market. "On a quarterly basis, foundry revenue changed quarter to quarter in 2015. The normal seasonal pattern of a very strong second quarter was not obvious, while most foundries continued to revise their business outlook during each quarter's earnings release," said Mr. Wang. "The peak inventory level for the semiconductor industry continued to push out during 2015, from the second quarter to the third quarter, and through the rest of the year."